Check Consumer Guide®’s extensive roster for its compact crossover/SUV class and you’ll see 5 Jeep product lines listed there. They present a choice of body configurations and powertrain offerings, but one thing that they have in common is some degree of commitment to off-road capability—something that can’t be said for every competitor in this popular segment. Compass Latitude models come with 17-inch alloy wheels. 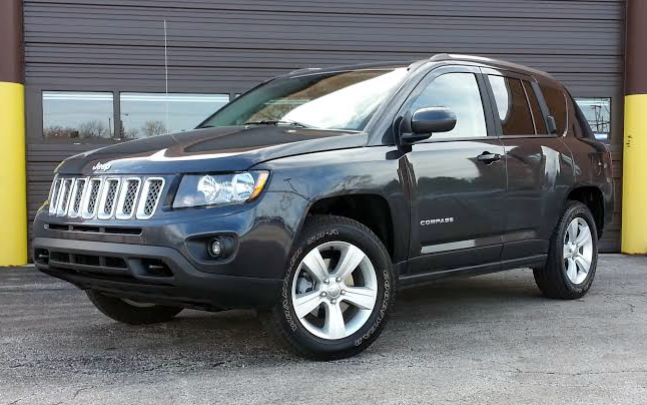 That said, not every Jeep rises to the top of the compact sport-utility pecking order. Some have shortcomings in other areas that make them less competitive in day-to-day on-road driving. That is the Jeep Compass’s story. In 2014, CG lauded the Compass for its off-road potential, interior space relative to its size, and available options for personalization, while criticizing its interior materials, acceleration, and noise levels. Nothing really has changed in these areas for 2015—the Compass is what it is. The Compass’s cabin is pleasant enough, but pales in comparison to most compact-SUV rivals. The Latitude comes standard with cloth-and-vinyl upholstery in a choice of two colors, heated front seats, cruise control, remote keyless entry, rear-window wiper and washer, air conditioning, 60/40 split-folding rear seats with reclining back rests, 4-speaker AM/FM/CD/MP3 audio, tire-pressure monitor, a leather-wrapped steering wheel with built-in audio-control buttons, tilt (but not telescoping) steering column, all-season tires on 17-inch alloy wheels, heated power side mirrors, fog lamps, halogen headlights, and an acoustic windshield. In 4×4 form, the Latitude starts at $24,795. However, the CG test vehicle reached $28,265 delivered, thanks to several option groups that added things like tow hooks, white-outline all-terrain tires, an upgraded audio system including navigation, satellite radio, a rearview camera, and remote starting. The 2.4-liter dohc powerplant is what Fiat Chrysler Automobiles calls its “World Engine.” In the Compass it makes 172 horsepower and 165 lb-ft of torque. It comes across as a little rough around the edges, with some vibration at idle and a habit of getting a little loud when roused. Acceleration is adequate, not thrilling, though the automatic works nicely. This driver put 207.2 miles on the tested Compass, 60 percent in city-type driving and with up to 4 people aboard, and returned a pleasing 24.13 mpg. By the way, with this powerteam, a Compass is rated for a maximum towing capacity of 2000 pounds. 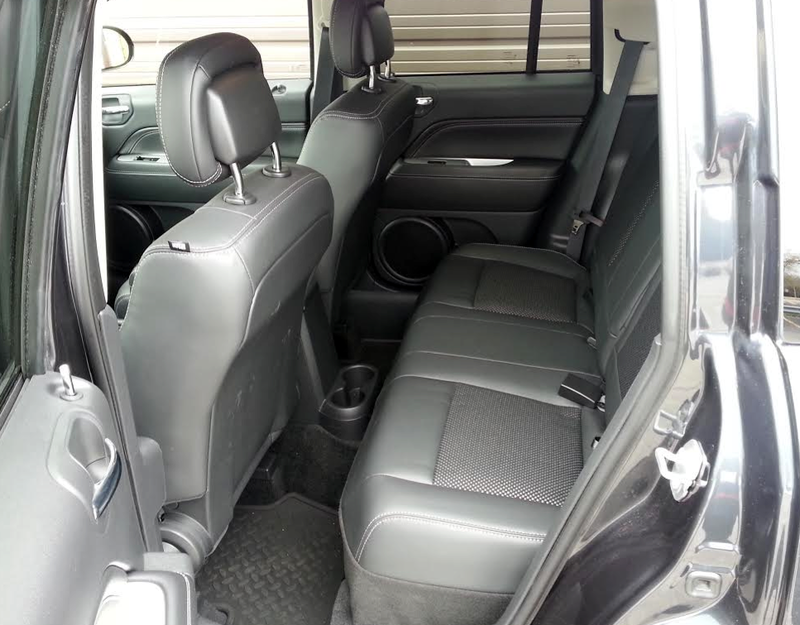 There’s ample space for four adults in the Compass, provided the front-seat passengers aren’t too tall. Ride reminds you that this thing really wants to be an SUV. It’s a little stiffer than a sedan ride, and the cabin is jolted somewhat when encountering pavement cracks and other road imperfections. The Compass’s overall compact footprint makes it fairly easy to park, but steering is not as light as in cars, either. All seats are firm enough for good support and comfort, but passenger capacity is, in truth, limited to 4—rear cup holders parked atop the driveline hump effectively see to that. 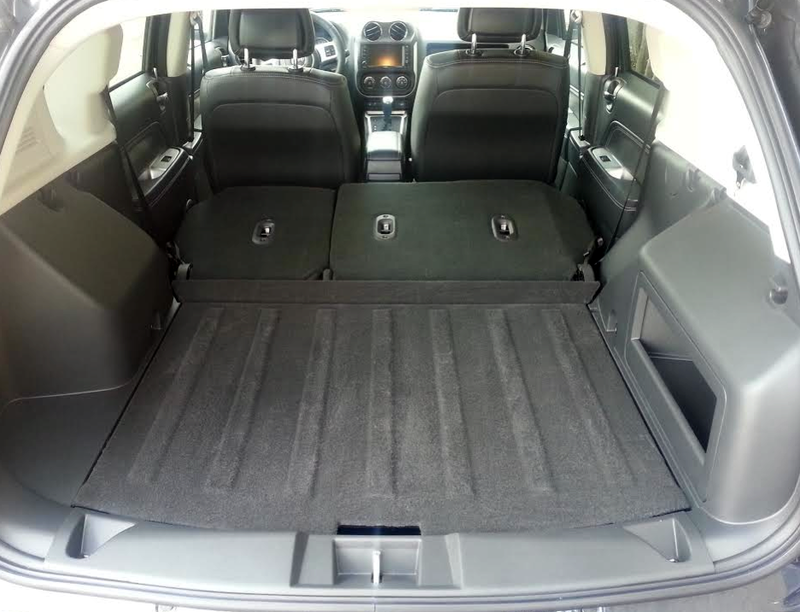 There’s a lot of front-seat travel to serve tall passengers, and if they don’t need all of that room, rear passengers have access to good stretch-out space. However, if a right-front passenger sits somewhat far forward and with his or her knees up, the large manual seat-adjuster lever bumps into the back of that passenger’s legs. Visibility is pretty good, but wind and road noise get to be hard to ignore at speed on the highway. Cabin materials are fairly businesslike, and not especially plush in look or feel. (You have to jump up to a High Altitude or Limited to get leather seating.) White contrast stitching and dashes of satin-silver-finish plastic prevented the cabin in CG’s test Latitude from being a featureless “black hole.” Hard plastic surrounds the touchscreen, climate controls, and part of the console around the shift lever. The tops of the dash and doors have a softer feel, but virtually no padding. Softer surfaces are found on door centers and the center arm rest, which slides fore and aft for optimal driver comfort. Personal-item storage is not so great. The glove box is small, though there is a large opening that functions like a tray cut into the dash above it. Door pockets are small in front and even smaller in the rear. Other spaces are a deep, square console box with a two-stage covered lid (the upper portion opens to reveal a long, shallow storage space); 2 open—and lighted—cup holders in the console; and the 2 cup holders at floor level in back. The seatback pouches and rear-seat pull-down arm rest found in so many other vehicles these days are not offered in the Compass. 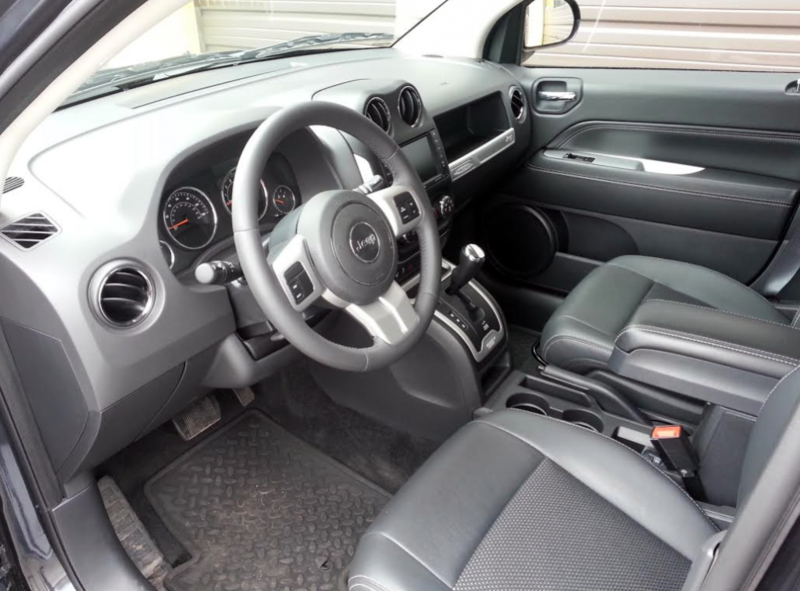 Compass boasts plenty of cargo space and a handy low load floor. On the other hand, the little Jeep’s rear cargo space is quite good. The load floor is flat and unencumbered by a raised lip, making for easy in-and-out movement of objects. Bumper height is just right for easy loading. Built-in cargo hooks are provided, as is an open cubby built into the right sidewall. The rear seats fold very nearly flat at the pull of a cord built into each seatback, opening up considerably more cargo space. The Compass has competitive base prices in the compact-SUV field, partly perhaps because it lacks a few features that competitors’ newer designs have added. Considering that it pays more attention than most to off-road capability, it’s hard to trash-talk this little Jeep. However, neither can you say it’s the pick of the litter. The Jeep Compass trails most compact SUVs in terms of road and engine noise, interior materials, and all-around refinement, but darned if it isn’t still a likable vehicle in spite of its shortcomings. A big part of the Compass’s appeal is its excellent packaging—it feels “right-sized” and ergonomically amenable in most every facet. Though the Compass’s steering feel may be heavier than most compact cars, I found it light enough to enable easy close-quarters maneuvering. And compared to a compact wagon, the Compass’s raised seating position offers tangible benefits in entry/exit and all-around visibility. 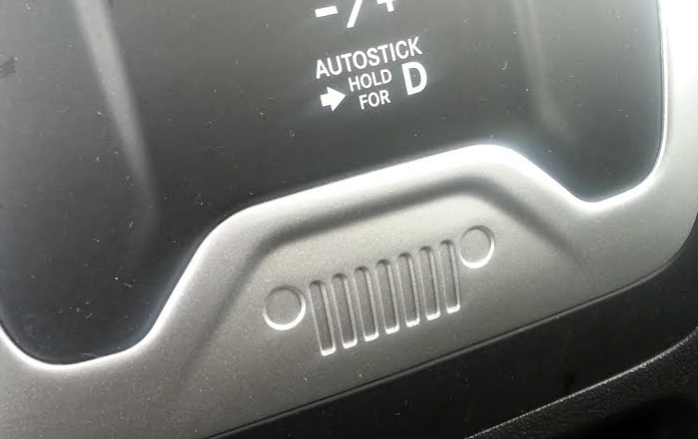 The Compass is not immune to Jeep’s placement of brand “Easter eggs.” This grille icon is found just below the shift lever. If I was feeling especially generous, I’d say that the sometimes-clunky, noisier-than-most drivetrain adds to the rugged feel that some Jeep buyers find endearing. However, that vibe is undermined by some very plasticky feeling parts in the interior, and oddly placed, plastic rear door handles that feel rather chintzy. 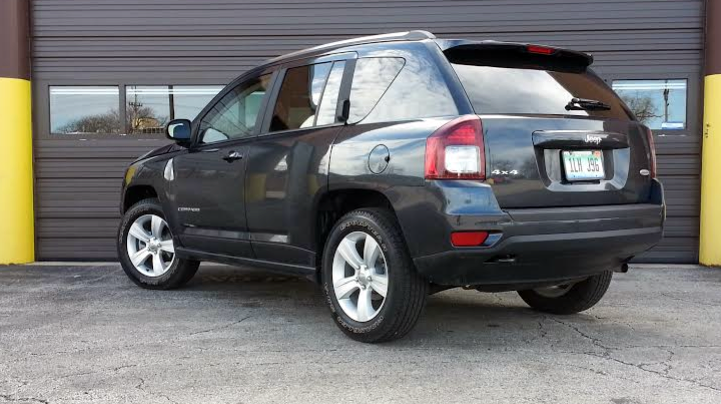 At an as-tested price of $28,265, our test Compass doesn’t come off as a particularly good value, but a more lightly optioned 4×4 example is an interesting choice for a compact-SUV shopper who wants to do some off-roading. Written by: The Daily Drive staff on May 21, 2015.on March 22, 2019.